Stay ahead with this stylish wool mix cover-up. 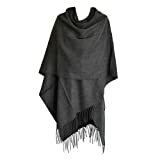 This modern and minimal poncho features a large funnel collar with contrast button detail. 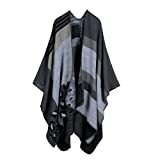 TOUTACOO, Large Women\'s Poncho with Tassels, Ruana. Made In France. XXL poncho/shawl with long plaited tassels. Made in France. This poncho will wrap you up in softness and keep you warm even though it is light. You can wear it both inside and out. Please note: cape.co.uk lists products sold via Amazon.co.uk. Please check product suitability before ordering.